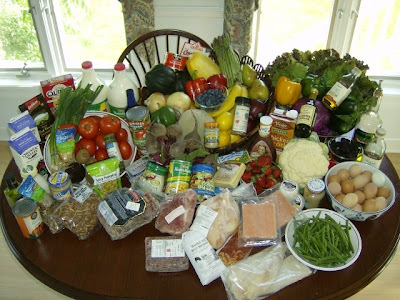 PJ, over at the Divine Low-Carb!, recently issued a challenge in a post, You Choose! The March of Madness for PJ, where she asks experienced low-carbers to present a plan for her to follow throughout the month of March. 1. I will choose one of them and officially follow it for March, from the 3rd to the 31st, four full weeks starting on a Monday -- because that is how my weight spreadsheet is set up LOL. and at the end of the month we will all see how well that given plan worked out for my body. I may not be perfect on it but I'll track what I do so it's fairly known what degrees of it I may have screwed up. MY THEORY IS, that since I don't have ANY given goal-setting plan that inspires me enough to make a commitment to it, that instead, I will make a commitment to someone ELSE: the commitment just happens to involve a given lifestyle plan. In the current state of affairs, eating is becoming terribly complicated by an under-current that suggests we feel guilty for eating, seek to limit our desire and pleasure from good food, and contantly count calories, grams of this or that and worry about everything we place in our mouth. No more of that - eat and enjoy what is allowed and simply pass on anything not on your list of good foods to eat. In addition, we don't live and eat in a world of grams - it isn't even natural to have to divvy up portions by cups, ounces or any other measure. We're supposed to just simply eat, but somehow we've come to a place where that's no longer a simple affair. Rather than fight that totally, I'm going to present information to calculate minimums for some things, that have to be included each day, ranges for others, and optional add-ins - these are to be calculated out for an individuals current weight so they're eating enough each day to avoid a state where the body conserves energy in the face of famine conditions, while also providing variety and good habits to build upon over time. In order to eat enough, one has to know how many calories they need, at minimum, each day - over the years I've found the basal metabolic rate (BMR) to be a good minimum to use. Online calculators, like the one at Discovery Health, are accurate enough for this purpose. Once you enter your information, it will return how many calories you need each day for basic metabolic function, before any movement or physicial activity. This is the minimum calories to target eating each day and it allows a +/- 5% range, so if you miss by 5% one day that's OK; if you're over now and then by 5%, that's OK too. Recalculate BMR with every 20-pounds of weight loss. Protein is, in my opinion, the most critical of foods/macronutrients to consume each day - it helps to regulate appetite, but more importantly provides the essential amino acids to repair and build within the body. Calculating out a minimum amount of protein to be "adequate" is fairly easy - you take your body weight in pounds and multiply it by 0.40. This will allow for an adequate intake of amino acids for both essential needs, and for the production of glucose through gluconeogenesis. But who lives in a world of grams? It's easier then to take the gram target and convert it into ounces each day - makes it easier to decide what to eat! So, to determine how many ounces each day, you simply divide the grams by 6.5 - the average amount of grams of protein per ounce in meat, cheese, eggs, poultry, fish. Now some have 7g, some have 6g - I suggest using the 6.5 as an average. Do not count plant protein in your minimum - so you can eat whatever cuts of meat, poultry, fish, game you want, and include eggs, cheese (real, whole milk cheese only - see below). You may also boost protein with whey or egg protein powder or RTD-shakes that contain only whey protein and less than 2g carbohydrate per serving. No soy protein isolates are allowed in the shake option. Eggs ideally will be from organic, free-range chickens; meats (ideally) should be grass-fed, pastured. Recalculate protein requirements with every 20-pound weight loss. Each day, eating enough protein is critical, so target eating at least the calculated minimum; eating more than that is fine if you're hungry and often necessary if you're active...so if you find you are hungry, eat more protein if needed, but avoid excessive protein consumption, which is hard to define, but generally means more than 35% of calories or greater than 0.8g-1g of protein per pound of body weight (depending on level of physicial activity). Dairy is included in your protein, but do not consume more than a combined total of 4-ounces of dairy foods each day - this includes plain whole milk yogurt, real whole milk cheese (no processed cheese allowed), heavy cream and/or half & half. Dairy must be organic. Olive oil, organic butter, virgin coconut oil, avocado oil, walnut oil, sesame oil, macadamia nut oil, drippings from bacon, real mayonnaise, or rendered fats from chicken or meat. What isn't allowed is anything that contains canola, soybean oil, vegetable oil, partially (or fully) hydrogenated oils or corn oil. Two exceptions: Salad dressing is one exception to this rule if one is using commercial dressing - canola based dressing is allowed in this case, if the carbohydrate content is 1g or less per 2-TBS serving. Real mayonnaise is the other exception if you cannot find one that is made with the acceptable fats/oils. The meats and animal foods consumed have fat content, so added fats/oils should be used to top vegetables and salads and the amount should be individualized to meet calorie intake minimums. Adjust fats & oils as appropriate with weight loss. If you are using an online food journal to keep track of things, like FitDay.com, the percentage of calories from fat will be high - greater than 60% each day, sometimes as high as 70% or more. Plant foods - vegetables, nuts, seeds, fruits, legumes - provide variety and also are nutrient-dense. The same cannot be said for most grains, so while you're losing weight, avoid grains, but eat enough of the allowed plant-foods each day to keep things interesting. As a rule of thumb, absolute minimum of non-starchy vegetables each day is 3-cups - choose whichever non-starchy vegetables you wish and top with whatever fats/oils you like, season however you want.~ You may include up to 6-cups of non-starchy vegetables each day if you wish. Herbs and spices may be used as desired. You may also include up to 1-cup of select fruits each day - any type of berries, canteloupe, honeydew melon or tomatoes.~ The caveat with the fruit is it must be accompanied by a protein-fat food, like cheese, yogurt or meat.~ For example, if you'd like 1/2 cup of blueberries, enjoy them in a 1/4 cup of plain whole milk yogurt topped with a tablespoon of walnuts or pecans, or in 1/4 cup of heavy cream. You may also have up to 2-ounces of any nuts/seeds each day.~ Nuts you may have include: walnuts, pecans, pine nuts, pistachios, sesame seeds, pumpkin seeds, and macadamia nuts; also nut/seed butters are an option. Two that are not allowed are peanuts (legume) and cashews. If your current body weight is greater than 300-pounds, you may include up to 4-ounces of nuts if needed to bring calories up to meet BMR. You may include up to 15 olives in a day - green or black; and/or 1/2 an avocado; and/or 2-TBS of legumes (chickpeas, red kidney beans, navy beans, peas, etc. - but no peanuts). A. Basic multivitamin-mineral complex that is not a "mega"....choose a capsule vitamin, not the brick-hard type; it should include 100% of RDA, but not "mega" levels. B. Cod Liver Oil and/or Fish Oil; depending upon time of year and where you live. During the winter months - mid-October through mid-April, if you're in a central or northern latitude, use cod liver oil; all others in sunny year-round locations, get sun and use fish oil instead; during mid-April to mid-October use fish oil if you're in a central or northern latitude while also getting your sunshine! Dose is generally 1-teaspoon per 50-pounds of body weight, with a maxiumum of 1-tablespoon per day. All are absolutely free to disagree, challenge anything I've written and/or comment about their experience (with a product or service)....but the above guidelines are a reminder that I do moderate comments, and while I'm reluctant to reject a comment, occasionally I find myself having to. If a comment of yours is rejected (doesn't appear) and you have a question about why, you can always email me and ask why. Dr. Jamie Bailes, a pediatrician at Marshall Unieristy in Huntington, WV, recently penned an article for Diabetes Health - The Fat-Free Fallacy: Is it Obesity's Great Enabler? Obesity in the United States is increasing in epidemic proportions. This is true in children as well as adults. It's estimated that the healthcare costs associated with obesity and its related complications will exceed $130 billion this year. If something is not done to stem this burgeoning tide of obesity, then the healthcare system that we know will soon crumble. Why are we seeing this dramatic increase in childhood obesity? It is certainly true that children are not as active as they were 30 or 40 years ago. Television, video games and computers can entertain kids 24 hours a day. Parents are often relying on technology to babysit their children and are not spending as much time outdoors with them exercising or just playing. Is this the only reason for the surge in obesity? As a pediatrician who specializes in childhood obesity, I see many children who are very active but they are also massively overweight. What about these children? I believe many of these children are victims of what I like to call the "fat-free fallacy." In 1977 the U.S. Department of Public Health issued a statement encouraging Americans to eat less fat. In 1988 the U.S. Surgeon General recommended that we restrict our consumption of dietary fat. The assumption was that as we eat less fat the thinner we would become. The multi-billion-dollar food industry was quick to jump on the bandwagon. The race was on to produce fat-free everything. If food didn't have fat then it was OK to eat as much as you wanted. Americans consumed more fat-free foods in the 90's than the previous three decades combined. This fat-free philosophy is exactly why we are becoming so obese as a society. Obviously if fat were the problem, then obesity would have decreased during this time. Instead, obesity did not decrease but skyrocketed to unprecedented levels. But fat is not bad for you. Being fat is. The two are not related! Fat actually helps to satisfy our appetites and keeps us from eating too much or too often. Fat is also an important flavoring for food. I, too, was a victim of this fat-free fallacy. I had been taught (brainwashed) that in order to lose weight we must eat less fat. I was a huge proponent of cutting back fat intake and watching total calories. I recommended at least 30 to 45 minutes of vigorous exercise daily. I knew that it was very hard to lose weight. I didn't push overweight children to lose weight, thinking that if they could just maintain their current weight as they grew that would be significant progress. I felt like I was doing a good job. I believed whole-heartedly that I was explaining to these children the correct way to lose weight. In the late 1990's, a first-year pediatric resident physician at Marshall University did a required research project in which he looked at about 100 children whom I had counseled about weight loss. The results were astonishing to me. Not only did these children not lose weight or even slow down their weight gain, most gained weight at the same rate and some even faster. The results did not lie. All of this time and energy that I had been spending to help children lose weight had been a waste of time. It just didn't work. A low-fat diet only worked for about one out of every 25 patients. Was this the best we could do? I was determined to succeed. I began to look at other ways to lose weight. A third-year medical student at the time asked me about using a high-protein, carbohydrate-restricted diet for weight loss. At the time I knew very little about approach. This was not something that was taught in medical school. I couldn't believe that this would be successful or that it could be good for you, so I was very skeptical. How could eating high-fat foods not be bad for you? This is what I learned in textbooks from professors in medical school. However, I still could not ignore the facts. We had cut back our fat intake and yet we were becoming fatter as a nation. I researched and relearned the physiology and biochemistry behind low-carb diets. As I began to take a closer look, my findings were not what I expected. It all came back to insulin. Insulin is what causes fat storage. Insulin is what drives weight gain. Insulin is what is secreted when we eat carbohydrates. Insulin is one of the most powerful and efficient substances that our body uses to control the use, distribution and storage of energy. Insulin is essential for life. Without insulin, we would quickly waste away and perish. Just ask the teenager with type I diabetes who has been hospitalized for diabetic ketoacidosis because of not taking his or her insulin. Let's look at what happens after a meal that is high in carbohydrates. Carbohydrates are broken down into thousands of molecules of glucose that are quickly absorbed through our small intestines into our bloodstream. Our body has the ability to monitor this rapid rise in blood sugar and quickly secretes insulin to counterbalance this. This is true if we do not have diabetes. Our nervous system keeps our blood glucose levels very steady no matter what we eat. These values almost never get above 120 or less then 70mg/dl. This is true whether we eat a meal that consists of pure sugar, a meal loaded with complex carbohydrates, a meal consisting of only protein or fat, or when we have fasted for two or three days. Almost all of our cells use glucose for energy. Our bodies are extremely efficient energy machines. Only a small part of what we eat is actually used or needed by the muscles or other cells for energy. If these energy-using cells do not need any extra energy what happens to the majority of the glucose that we ingest? Insulin converts a portion of that glucose to another starch, called glycogen. Glycogen is stored in the liver and can maintain our blood sugar levels in the normal range for several hours after a meal. This is why we do not have to eat continuously. Glycogen can quickly be converted to glucose whenever glucose is not readily available in the bloodstream. What about the rest of the glucose? Where does it go after a meal? Herein lies the answer to why most low-fat diets do not work. The extra glucose is converted to fat. Fat is our main storage area for energy. Let me say this again: insulin promotes the production and storage of fat. That's right, even without eating fat our body produces fat from sugar. Insulin is an extremely efficient hormone. It is the master hormone of our metabolic system. Its most important function may be the control and maintenance of our blood sugar, but insulin performs a myriad of other activities. In the appropriate amount, insulin keeps the metabolic system running smoothly and everything in balance. However, in great excess it becomes a dangerous hormone wreaking havoc through the body. Mountains of scientific evidence implicate insulin as the primary cause or significant risk factor for high blood pressure, heart disease, arteriosclerosis and high cholesterol. It may also have a causative role in type 2 diabetes. With type 2 diabetes our body needs extra insulin to help to maintain our blood sugar. The insulin that is available just does not work as well and we become resistant to its effects. With type 1 diabetes we have a little different story. Our body can no longer make the insulin that we need therefore we have to take manufactured insulin to maintain our blood sugar. More carbs equals more insulin. Teenage girls with diabetes know that insulin causes them to gain weight. Many recent studies have shown that in order to keep from gaining weight a very high percentage of teenagers with diabetes omit their insulin. We cannot continue to allow this to happen. This leads to uncontrolled diabetes and horrible long-term complications. So, how can we control our insulin requirements? The key to good blood sugar control, the key to weight loss and the key to lowering our insulin secretion is very simple. Eat fewer carbohydrates and eat more protein. Protein keeps us from being hungry. A meal high in protein stays with us a lot longer than a meal high in carbohydrate content, which is quickly absorbed and does not satisfy our appetite as long. When we eat protein our body does not need as much insulin. Our blood sugar values are much steadier and we do not have the wide fluctuations that we see with high carbohydrate foods. This dietary approach works whether you have diabetes or not. It is perfect for anyone who is overweight or has type 2 diabetes. Type 1 people with diabetes can benefit by improved blood sugar values and lower insulin requirements. I have seen hundreds of children actually lose weight with our plan. Eight and nine year old kids have lost 40 to 50 pounds. Obviously, the health benefits are tremendous, but the greatest improvement is what we see with self-esteem. Children's energy and blood pressure improve, and their lipid profiles universally improve. Before-and-after pictures of these successful children can be viewed on our website http://www.nomorefatkids.com/. In general, the fewer carbohydrates we eat the better. However, we should get a minimum of 30 grams of carbohydrates per day. The standard approach of 60 to 75 grams of carbohydrates per meal and 30 grams per snack is way too much. If you do not want to restrict carbs to 30 grams per day, then somewhere between 60 to 100 grams per day will still allow for weight loss if it is combined with exercise. Remember: Eat all the protein you desire. Do not worry about where the protein comes from or how it is prepared. People who eat more protein end up eating fewer total calories. Protein keeps us from being hungry and satisfies our appetite more than any other macronutrient. This is the key for successful weight loss. It is hard to lose weight if you are hungry all the time. Many people who follow low-carb diets do it to achieve greater blood glucose control. Therefore, it was disconcerting when ten days ago the news was full of a large study of diabetics ("ACCORD") which was halted when it was found that patients in the more aggressive treatment group, who had lower blood glucose as a result, had more deaths than the patients with higher levels of blood glucose. Note that none of the researchers said that the lower blood sugar itself caused the result -- it could have been the more agressive drug therapy that these patients were on, or some other factor. Nor are they clear on what caused the extra deaths at this point. And no one was recommending that treatment programs or goals be changed based on this preliminary data. In fact, the American Diabetes Association recommended not changing anything. However, this did not stop the media from producing headlines such as, "Diabetes Study Shows Lowering Blood Sugar Increases Death Risk" and "Diabetes Study Upends Another Long-held Belief". In my opinion, these kinds of headlines are blatantly irresponsible, and I also wonder what is to be gained by blasting this story everywhere before we have a decent analysis of what was going on in the study. The findings in the ACCCORD study prompted researchers in Austalia to peek into a similar study in progress there called ADVANCE. Were the results the same? No, not at all! Their data did not show increased deaths in the lower blood glucose group, despite the fact that twice as much data has been collected so far in the ADVANCE study. So the interim advice is to wait until the results of both studies, plus one additional similar one, are available. Dispense wisdom. Don't be gross. No profanity." Next week I'll review Pollan's newest book, In Defense of Food: An Eaters Manifesto - in the meantime, you can add your own 2-3-2 creation in the comments here! Last week I posted about our collective belief, as a nation, that weight loss and maintenance is a problem solved by simple math - balance the "in" with the "out" columns of the calorie ledger and weight will be lost when the "out" exceeds the "in" and will be maintained when the two are equal. I threw out the idea that weight isn't simply about math, but about chemistry. The latest issue of the American Journal of Clinical Nutrition is out, and within is a very intriguing study where this very issue was central to the research conducted. It's one piece of the "weight is chemistry" equation, so let's take a look. In the study, A novel interaction between dietary composition and insulin secretion: effects on weight gain in the Quebec Family Study, researchers followed subjects for six years to see what effect, if any, levels of insulin secretion had on weight. The objective was to "determine whether physiologic differences in insulin secretion explain differences in weight gain among individuals consuming low- and high-fat diets." This interest to investigate such was born from clinical trials where subjects consumed low-fat diets where results often revealed that there are huge variations between individuals consuming similar dietary ratios of macronutrients and reported calories; these differences are often chalked up to psychological and behavioral factors - motivation, compliance with diet, under-reporting of foods consumed, etc., ignoring the possibility that there is a physiological variation that may be at work. In this study, the researchers noted the findings of Dansinger et al who compared four dietary approaches (Atkins, Ornish, LEARN and Zone), noting that "Of those assigned to the Ornish very-low-fat diet, mean weight loss was again small, 2 kg, but individual weight change ranged from almost –30 kg to >10 kg. This interindividual variation is commonly attributed to differences in motivation and compliance, but biological factors may also be contributory." Thus the researchers in this study considered the the following for a test hypothesis: Low-fat diets are inherently high in carbohydrate because, for most people, the third major nutrient, protein, remains within a fairly narrow range. Carbohydrate has the most potent effect on insulin secretion of the major nutrients. Therefore, individuals with high insulin secretion consuming a low-fat diet might be especially susceptible to weight gain. To investigate this, they "examined the associations between insulin concentration at 30 min (insulin-30) during an oral-glucose-tolerance test (OGTT) and change in body weight or waist circumference in the Quebec Family Study (QFS)" over a period of six years." The findings were very interesting. The primary findings of this study are that a proxy measure of insulin secretion strongly predicted weight gain and change in waist circumference over 6 y in adult whites, especially among those consuming lower-fat diets. ...our results and those involving GI suggest the existence of a unique physiologic phenotype that responds poorly to high insulin-stimulating diets, regardless of whether these diets are high in carbohydrate or have a high GI. Moreover, the combination of a high-carbohydrate and high-GI diet—that is, a diet high in glycemic load (GL)—may produce especially great weight gain among individuals with this phenotype. While the researchers reached the conclusion that these findings suggest there exists a "unique physiological phenotype that responds poorly to high insulin-stimulating diets" - such assumes we're supposed to consume a low-fat, high carbohydrate diet; if we're not responding well to such a diet, it's because some have a unique physiological phenotype rather than consuming a diet that is at odds with human physiology. I'd counter that it's just as likely it has nothing to do with a "unique phenotype" among us, but rather the expected results of a modern diet at odds with our physiology. Minor quibble. Nonetheless, the finding is important as it points directly to individual metabolic factors playing a role within the context of the diet - low fat verus high fat - not just calories. In this study, it was insulin secretion. It mattered, especially in those consuming a low-fat diet. ...a major federal study of more than 10,000 middle-aged and older people with Type 2 diabetes has found that lowering blood sugar actually increased their risk of death, researchers reported Wednesday. It's hard to make heads or tails of what happened as the actual data has not been released - we're left to read through press reports and information provided by the NIH to try to determine what went wrong in the trial. Everyone seems to be bending over backward to get the message across that the intensive drug therapy - a large number of pharamaceuticals taken together - had nothing to do with the higher incidence of death in the trial. But one must really wonder! Speculation abounds, but that hasn't stopped some from foisting out the idea that it is the lowering of blood sugars to normal ranges that was the problem, not the means utilized to do it. Dr. Irl Hirsch, a diabetes researcher at the University of Washington, said the study’s results would be hard to explain to some patients who have spent years and made an enormous effort, through diet and medication, getting and keeping their blood sugar down. Call me crazy, but didn't this study throw every pharmacuetical intervention at these folks? Perhaps the problem wasn't the lowered blood sugars, but toxicity and side-effects from massive drug therapy to acheive a lower blood sugar level? What this trial lacked was a control group utilizing an effective, non-pharmaceutical approach - a carbohydrate restricted diet - to lower blood sugars and A1c, which would have resulted in less medication, not more to achieve glycemic control. If and when the data is published, I'll update - but for now think it highly irresponsible of anyone to speculate that it was simply the lowering of blood sugars that caused the problem given the wide variety and large number of medications used to intensively reduce blood sugars; and worse is to suggest that those with type 2 raise their blood glucose levels! PETA to Mississippi: "Let Fat People Eat!" Jackson, Miss. - A provocative bill introduced by state representative W.T. Mayhall Jr. that would bar Mississippi restaurants from serving obese people has captured PETA's attention, but the group is suggesting an amendment. The animal rights group thinks it can do HB282 one better: instead of refusing to serve overweight people altogether--something that would raise the ire of restaurants and patrons alike if the bill were actually passed and implemented--PETA is proposing that restaurants be required to serve only healthy vegan meals to consumers who are struggling with their weight. Citing research studies that show that vegans and vegetarians are much thinner on average than their meat-eating counterparts, PETA points out that most vegan foods are naturally high in fiber (there is none in meat and dairy products), and low in fat and contain zero cholesterol (which is only found in animal products). "There's no reason to starve fat people--they just need to pile their plates with healthy, vegan food," says PETA Vice President Bruce Friedrich. "Vegan meals like hearty vegetable casseroles, bean burritos, and pasta with mushrooms, tomatoes, and green peppers not only are satisfying but will slim you right down too." The Honorable W.T. Mayhall Jr.
On behalf of PETA's more than 1.8 million members and supporters, I am writing to commend you for your creative effort to combat the obesity epidemic in Mississippi. I'd also like to suggest a change to HB282 that we think would make it truly effective. Changing the bill slightly would not just make a point--it could actually address (and even solve) Mississippi's obesity epidemic rather than simply generating a discussion about it. Instead of refusing to serve obese people, restaurants could be required to serve them only vegan dishes. Vegan food is not only delicious and satisfying, but overwhelming scientific evidence shows that vegans and vegetarians are far less likely to be overweight than meat-eaters. Vegans are also far more likely to be in better overall health because, among other things, vegan foods contain no cholesterol and lots of fiber, the complete opposite of meat- and dairy-based meals. The American Dietetic Association--the nation's largest group of nutrition professionals--reviewed hundreds of studies and concluded that vegetarians have lower rates of obesity, heart disease, diabetes, and certain types of cancer than people who eat meat. A U.S. government review of studies on weight loss found that two-thirds of dieters gain back all the weight they've lost within a year, and a whopping 97 percent gain it all back within five years. The only weight-loss plan that has been proved to take weight off--and keep it off--for more than a year is a vegan diet. Most vegan foods are naturally low in fat, so quantity and calorie restrictions are often unnecessary. Obese people can still eat the portions that they're used to while watching pounds slip away and good health return! Please contact me at 757-622-7382 if you have any questions. Thank you for your consideration. Please accept PETA's best wishes for good health (and trim waistlines) for all Mississippi residents. Many will recall the bill introduced in Mississippi that would ban restaurants from serving obese people. Now it seems some recognize that such a law would be unworkable, so they're trying to tweak it along to be more palatable for passage. A press release today touts the ideas of public interest law professor John Banzhaf, who suggests "Focusing your bill on protecting children rather than adults would remove the major objection to it, and provide a strong argument for it - one likely to be echoed by many groups concerned about child health and welfare." No employee of a fast food chain outlet shall serve to any child who appears, to a reasonable person, to be under the age of 16 and to be obese, any single food item reported by the company to contain more than 500 calories, nor any meal where the calories in all of the food items in the meal (including any drinks, but not including sauces not provided at the counter) as reported by the company exceed 1000 calories. However, all such food items may be served if the child is accompanied by a parent or guardian, or if the child presents a letter or note on the letterhead of a physician, hospital, or other health care entity certifying that he is not obese or that for medical reasons he should be served such food items, or if he or she provides such proof in a form or manner approved by the State Department of Health, including but not necessarily limited to, a wallet-sized card from any of the above sources or from the school which the child attends.